The problem of how to get a cat into a carrier is one shared by many cat owners. Many people, including myself, have struggled with this over and over again. Or maybe I should say believe it or not if your cat is difficult! There are a number of different techniques you can use in the moment, including scruffing, using cat restraint bags, and a towel or blanket. But, the very best method is to start long before it's time for your cat to travel, or your cat cat has a vet visit. Let's look at some advice from experts on both the immediate method, and the long term approach. In the past, I made two big mistakes with regard to the carrier and my cats. Don't be like me. Based on these mistakes, I personally suggest two things. One, if you don't have the right kind of pet carrier, get a different one. I used to use a cat carrier with a single door. It was very hard to get the cats in and out of that carrier. A top-loading hard-sided carrier is much easier on both you and your cat. There are also some soft-sided carriers that may be easier as well, but I went with a top-loading Petmate (Amazon) model for Jazzy, and I'm very glad I did. It's the first top loading carrier I've ever had, and I wish I had done it years ago. 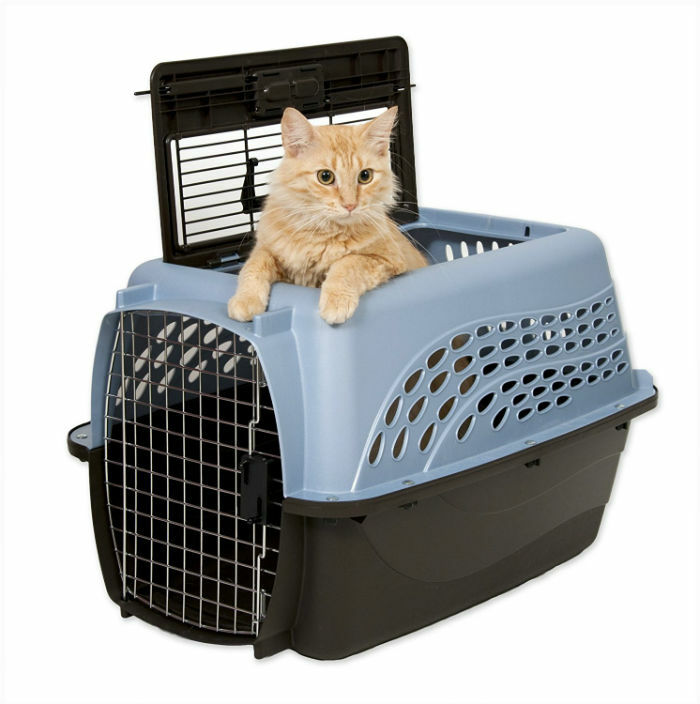 Two, integrate the carrier into your cat's life, as described in the AVMA video below. I used to keep the carrier locked away until it was time to go somewhere. Big mistake. My cats were not big fans of car rides or the veterinarian. As soon as they got a hint that we were going somewhere, they would run and hide. After struggling to get them out from under the bed or from behind the refrigerator, it was extremely difficult to get them into a carrier that was not top-loading. The below video shows how not to get a cat into a cat carrier, complete with screaming. Does that scene look familiar? You're going to be late to the vet's office yet again, and look, there's blood on your arm. I've been there many times. Funny (or not) how so many people have carriers that are not really made for easy entry. OK, so no one else has a cat that gets into the carrier by himself? Thought so. For all of us normal cats out there, now let's look at how to get a cat into a carrier the correct way. The best way, of course, is not to bring the carrier out only when you're going to take your cat to the vet. If the carrier only comes out when your cat is going to travel, and she hates car rides, well, guess what?